I’m not typically drawn to French cuisine but I had heard good things about Miel and was excited to try it out. Matt & I originally planned on using our $50 Groupon to the Barking Crab, but they don’t take reservations on weekends and after calling ahead found out there was a “38 person wait for the 16 tables”. For whatever reason they couldn’t tell us what that meant in terms of hours, so instead of wasting time & waiting around we hit up OpenTable. Located in the InterContinental hotel overlooking Boston Harbor, Miel has a classic raw bar and a menu focusing on specific flavors such as herbs, lavender, honey and olive oil. Sounds refreshing! Menu: Seafood Raw Bar, Soups, Salads, Appetizers, Entrees, and Side Dishes. There were a couple of dishes that caught my eye, like the Parsnip & Chestnut Bisque, the Honey Basil & Scallops, and any one of those pasta options, but I was looking for a lighter meal so I went with a 1-course entrée option. I enjoy tuna but the driving factor for ordering this dish were the accompaniments, mainly the Basil Polenta with Mascarpone. 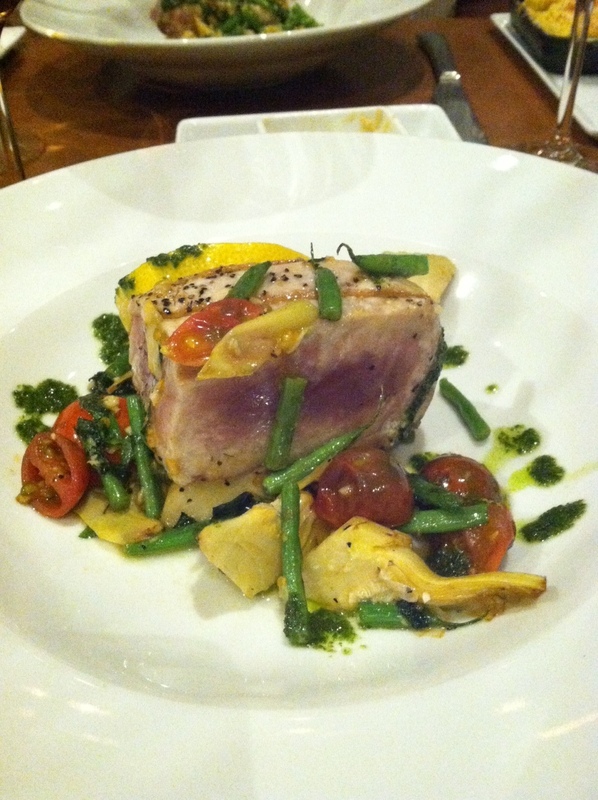 What I received was tuna, tomatoes, green beans, artichokes and pesto, with a side of baked, dried, plain polenta. I have never been more disappointed! The description in no way matched what was put in front of me. Thankfully the meal was good, so I finished it without any complaints to the server about the menu discrepancies. 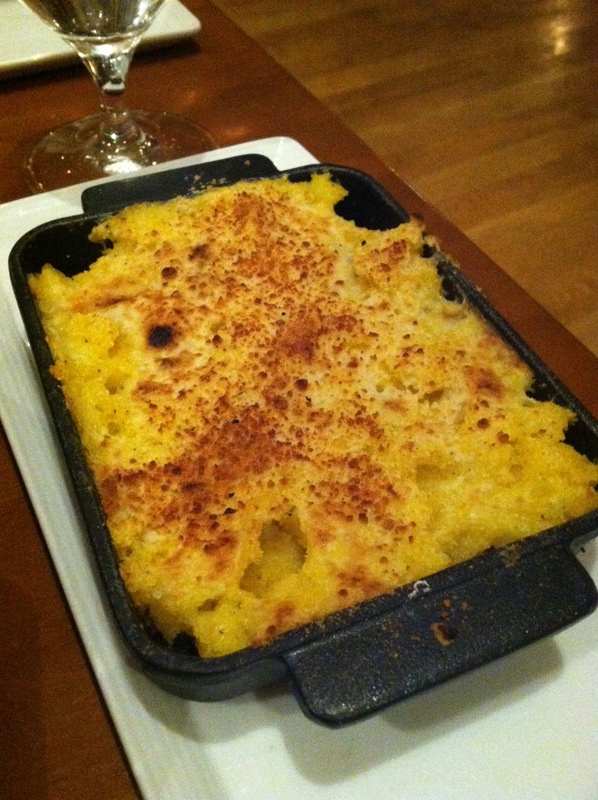 The polenta however wasn’t worth 2 forkfuls, so I left pretty dissatisfied with the whole experience. Service: The service was a bit spotty; we arrived to an empty, dimly light dining room where there was no one to greet us. If I hadn’t made a successful reservation on OpenTable I would have thought they were closed. We were eventually led to a table in the back part of the restaurant where everyone else was seated. 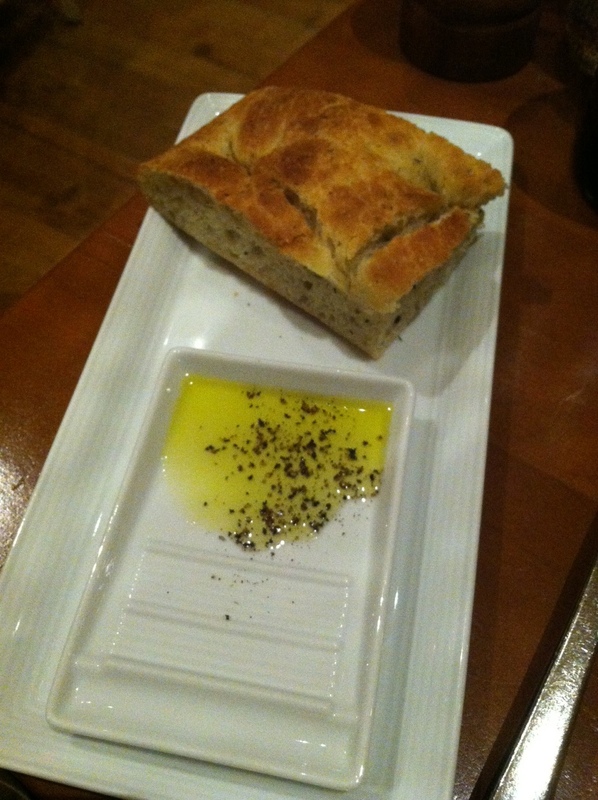 Our waiter took our wine order and brought us bread, but there was a different hurried server who took our app/entrée order. Our meals arrived in a timely manner; too bad it wasn’t what I thought I ordered (see above). Matt asked for a side of asparagus that only came ½ way through our meal because we reminded waiter #1 that he had ordered it. Overall: The food was fine, but we clearly didn’t have the best experience. The dining room seemed empty for a Saturday night at 8pm. The tables were so spread out and I was uncomfortable with the amount of bare floor space – it felt like something was missing! They have an outdoor patio overlooking the water that would be nice to have a drink on. I’d maybe go back for the other tempting menu items, but who knows if those are even accurate. 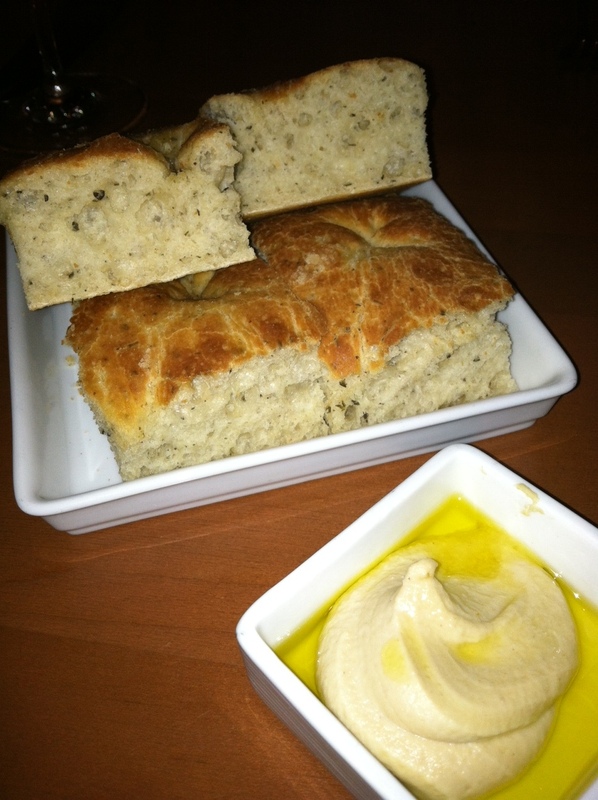 The Perfect Bite: The bread was really excellent, especially dipped in that creamy hummus. This entry was posted in Waterfront by Dena Raffa. Bookmark the permalink.